Midcoast Maine NEMBA rides, builds trail and promotes all things related to mountain biking in the Camden, Rockport, Rockland and Lincolnville area of coastal Maine. We partner with local government, landowners and land conservation groups to secure cooperative, community-based support for mountain bikers and a connected trail system. New members and new riders are always welcome! Spring in Maine often means snow-covered roads, frost heaves, mud, or some devilish combination of all three. Any given Sunday could well bring bluebird weather or a wicked nor’easter. What better way to get off the couch than to join 150 of your soon-to-be friends for a 31-mile riding adventure on quiet roads through beautiful countryside? 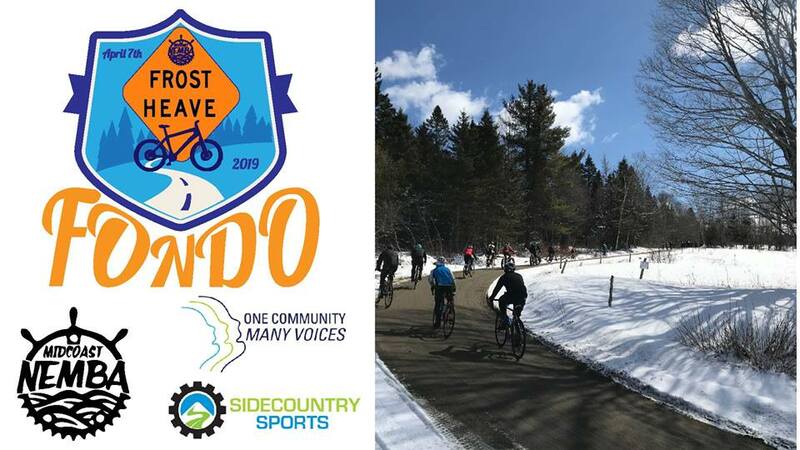 The Midcoast Chapter of the New England Mountain Bike Association is partnering with One Community Many Voices to host the first annual Frost Heave Fondo (big bicycle road ride) on Sunday, April 7th in Searsmont. The Frost Heave Fondo course will take you over a variety of roads – smooth pavement, rough tarmac, rutted dirt with muddy and/or icy spots, etc.– so whatever bike you choose could be the wrong bike at certain times. Bring whatever bike you’re comfortable on (we expect most folks to be riding knobby-tired gravel bikes or mountain bikes) and have a blast. Remember, this is not a race and the goal is to have fun and raise money for local Non Profit, One Community Many Voices (OCMV) and the Midcoast Chapter of the New England Mountain Bike Association. OCMV, focuses its efforts on providing gap funding to help overcome barriers related to youth aspirations, elderly independent living, well-being, and employment/skill development. In return, recipients paid it forward through volunteering in the community.